Over the last 40 years or so we have learned a lot about the lives of Bird Island’s Sooty Terns while they are nesting on the island. Thanks to the development of new tiny tracking devices, we are now beginning to learn something of their lives at sea. Recently, I wrote about the remarkable findings of our study of the birds’ migrations away from the colony between breeding seasons (see the blog post of 7 December 2017). Even during the breeding season our Sooty Terns obtain all their sustenance from the sea. We can see them drinking sea water just off the beach but where they obtain their food, mainly small fish and squid, has not been known. Now, we have reported our first results from tracking breeding birds using tiny PathTrack (www.pathtrack.co.uk) Global Positioning System (GPS) loggers, that record information on the locations of the birds about every 10 minutes. 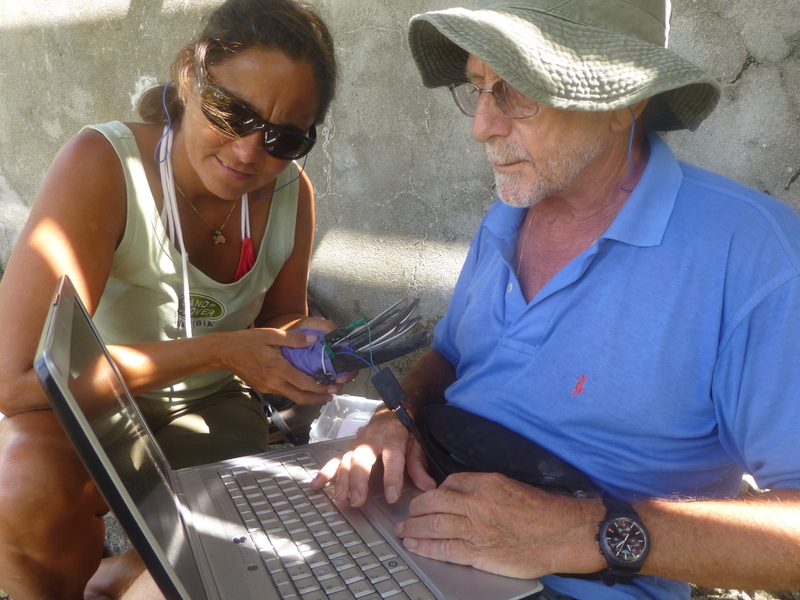 When the birds return to the colony after a bout of foraging, during which the mate remains on the island to continue incubation of the egg, we catch the returning bird in order to download the information on to our computer. Our first attempt at this was in 2014 and the results have just been published*. By pure chance, this work began during a period of food abundance but ended during a spell of extreme food shortage, which led many incubating birds to desert their eggs and young chicks. 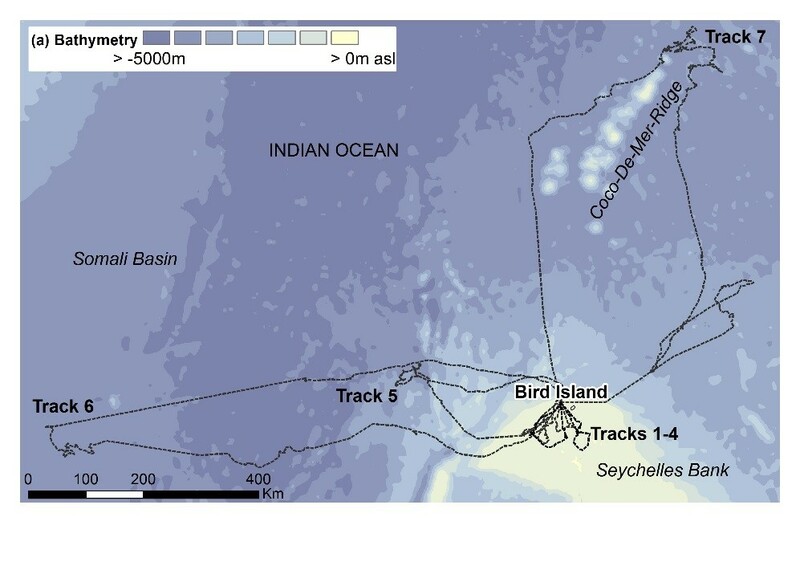 During food abundance, four tracks showed that the birds fed mainly over the shallow Seychelles bank to the south of Bird Island, within 100 km of the island and undertaking round trips of up to 360 km. By contrast, during food scarcity our three tracks revealed that these birds fed up to 900 km from the island and travelled a total of up to 2700 km in order to procure their food. One bird travelled west from Bird Island and fed almost half way to the African coast, which another flew north and obtained some of its food near the Coco-de-Mer sea mount! These tracks were all of birds during incubation, during which they only have to find food for themselves. After hatching they would have needed to find even more! Our observations suggest that the food supplies over the Seychelles Bank collapsed but we have no idea why. 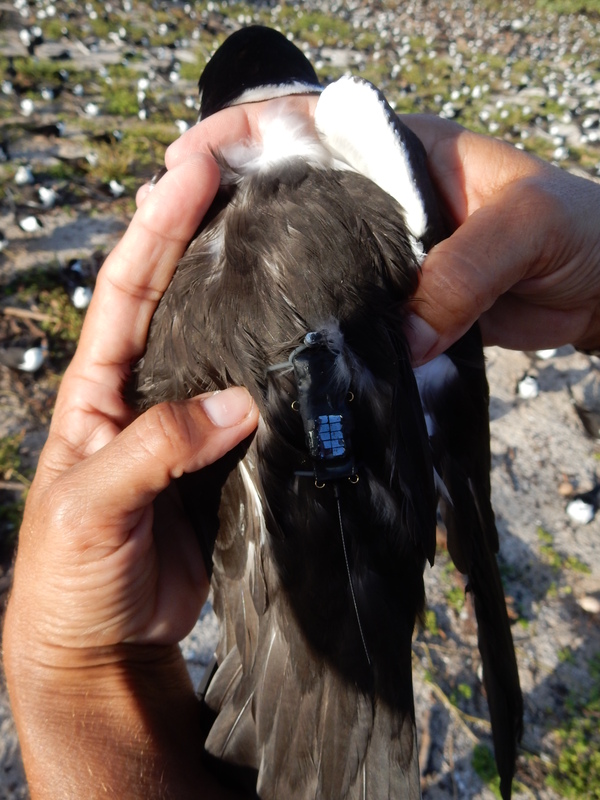 Having established that GPS loggers can provide such valuable information on the Sooty Terns’ at-sea activities. we are continuing these studies in the hope that longer term data will offer useful guidance in the designation of Marine Protected Areas in Seychelles and thus help to safeguard the future of Seychelles’ marine life in the face of the numerous threats that they face. This work was made possible by contributory funding from the British High Commission (Seychelles), James Cadbury, the Percy Sladen Memorial Fund and U3A Haslemere. We are most grateful for this, and to the Seychelles Bureau of Standards for approving the project and to Bird Island for providing facilities and supporting the Sooty Tern research for so many years. *Neumann, J.L., Larose, C.S., Brodin, G. & Feare, C.J. 2018. Foraging ranges of incubating Sooty Terns Onychoprion fuscatus on Bird Island, Seychelles, during a transition from food plenty to scarcity, as revealed by GPS loggers. Marine Ornithology 46: 11–18.